The learner should go to the MS-CIT Authorized Learning Centre (ALC). To find out a MS-CIT centre nearest to you, click here. The learner should fill an application form available at the MS-CIT Authorized Learning Centre (ALC), along with the prescribed fees. The fees can be paid in three modes. To view the detailed fee structure, click here. Once the learner submits his/her details, relevant documents and pays the fees, the MS-CIT ALC coordinator will fill the learner details in the MKCL software and upload the learner data. Further, the ALC coordinator will hand over a fee receipt. Learner is expected to verify the online details filled in by ALC. MS-CIT is an Information Technology (IT) literacy course started by MKCL in the year 2001. 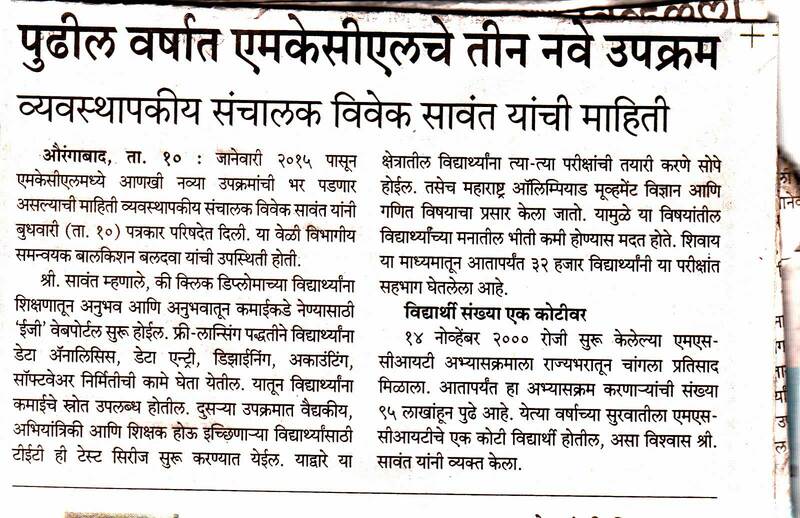 It is the most popular IT Literacy course in Maharashtra. Copyright © 2019 MKCL. All rights reserved.